When you have a special needs child the number of "teachers gifts" go way up. My oldest son is in a general ed classroom of K-2nd grade. There are two teachers, one is for the hearing impaired students, 2 interpreters and the aide that comes in to assist my son for 2-3 hours of the day. Then there is the Occupational and Speech therapists. I also include my son's special ed teacher from last year because she continues to advocate for him and watch over him all on her own. She isn't his teacher anymore but she is our friend. The school psychologist has also been thrown into the mix in the past. Then there is his little brother, who is in preschool. He has 1 teacher, 2 aides and a speech therapist. A small village is helping us to teach and raise our boys. I don't know what I would do with out any of them. I can't say enough good things about them. We have been fortunate to have fantastic teachers, aides and therapists working with our children. Under their care, my boys are sprouting wings. I have always made it a point to let them all know in some small way how grateful we are. I know exactly how my children are doing in school. I know that the progress my boys make is due, in part, to their guidance. I have always taken their advice to heart. In the world of Autism, no one set of therapies or "treatments" is right for every child. There are many, many, too many therapies and treatments and teaching methods out there that promise results. You could get swallowed up by them and overwhelmed. Along the way, my son's early interventionist, teachers and therapists have gently guided me along. It makes a big difference. I have not had to deal with the stress of fighting with the school to get services for my child and I hope to never have to. I will never forget how these people have impacted our lives. I could probably narrow down the list, but every single person I have mentioned works with one of my children. How can you leave them out, even if they are not directly responsible for my child? They still have an impact. We give them gifts at Christmas, Valentines and at the end of the year. I never give the same thing twice. Last year for Christmas I gave them all homemade vanilla (4oz bottles with beans included). For Valentines I gave them chocolates in little fabric bags tied with a bow and a heart card that the boys wrote on. Last years end of school gift were mini roses in cute wooden pots with a note on them that my son wrote saying "Thanks for helping me to grow." He signed it with a heart and his name. I scanned it in and printed them out and glued them to the pots. This year my idea stems from a gift in a jar. However, I am not using jars or the standard gift in a jar recipe. I am using some from my Make-a-Mix cook book. In side this book is a basic brownie mix recipe. 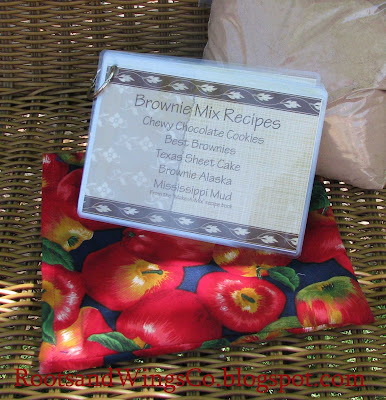 With that brownie mix you can make brownies and 4 other recipes. 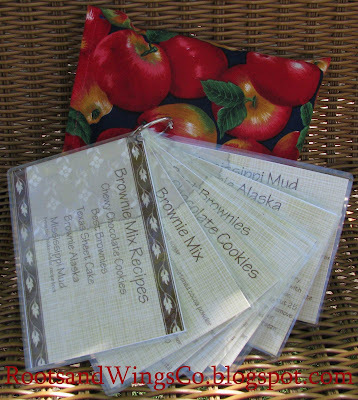 4x6" laminated recipe cards for all 5 recipes, 4 brownie topper recipes plus the recipe to make more mix. This is the front card with a table of contents. On the back side I have a saying. 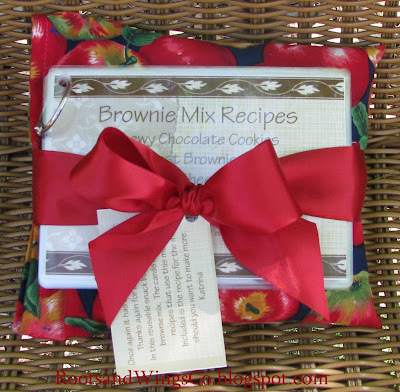 "Just like this Brownie Mix, you have given me the basic ingredients so that my tomorrow is filled with options. Thank you, D 2009" the back of the card also has the same background pattern as they other sayings cards. I wish I could say that I came up with all the sayings I used. The only one I came up with is the first one there with the thank you and my son's name. Some of the recipe cards have the recipe continued on the back and some do not. Those that don't have a saying on the back. This one is on the back of the Brownie recipe card. This one is on back of the brownie mix recipe card. I liked that it is a variation on a classic. As a student I never thought that the teachers may be singing there own song on the way home that last day of school. This last saying is on the back of the Chewy Chocolate Cookie recipe card. I liked this saying so much that I had to use it. Though, I admit I was worried about using a sentiment that talks about "God". I am not very religious myself and I worry about using such sayings when I don't know how the recipient will feel about it. In this case I used it because I think anybody will like it's meaning. I am going change a couple of the sayings for the aides and the therapists. Now I just have to come up with them. I think that is the hardest part about this whole project is coming up with just the right sentiments. I am particular in that way. I try very hard to relay just how grateful we are and how fantastic we think they are. Their jobs should never feel thankless. They should never wonder what they are doing it for. When a parent shows appreciation for what they do, it goes a long way. For copyright reasons, I am not going to post the recipes here. 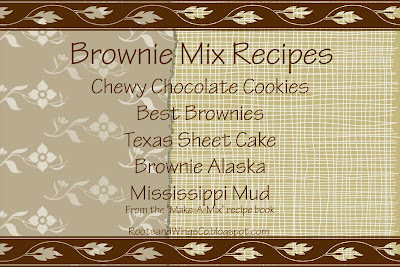 But I will say that I was able to google "make a mix brownie mix" and find the basic recipe there for the mix. If you have any other questions please feel free to send us an email. Sign in when you leave a comment and we will email you a response. I laminated the cards and punched a hole in the corner and put them on a ring. The ring opens up so they can remove the card from the rest if they want. What I like about this gift is that I can make a lot of them with out spending a ton of money. Mostly this will just take time. I only have to make the cards on the computer once and then print and cut them out. I think this will prove to have the "wow" factor with out costing a lot of money per person. I purchased my fabric from the remnant bin. If I need more fabric, I will use what ever fabric remnants I already have. I just liked the apple fabric for the teachers. You can find the Make-a-Mix cook book HERE. You will find all the recipes for this and more in it. You may also be able to find it at a local library, be sure to check their on line catalog to find out. 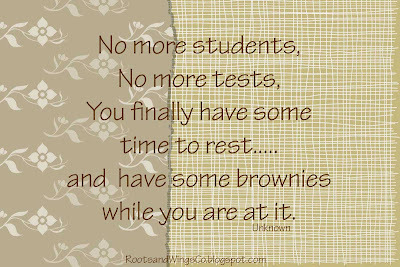 Quick update: I have given out some of these to the teachers, aides and therapists already. The verdict is they loved them and they haven't even seen the sayings inside yet!! So happy to get something from us. I still have a few more that I am going to give out next week. These took a bit of time because of how many I had to make (13) but so worth it in the end. If you only have a couple to make they would be super quick to put together. Oh and I had some extra brownie mix left over. So I made a batch of brownies and visited my son's old pre-school teacher. I gave them to her and her aides. We had a chance to catch up. That was really nice. Like seeing an old friend. Wow what teacher would not want that? This is a such a fun (and YUMMY!) idea, I love it! I'll be linking. Come on??? How amazing is this???? 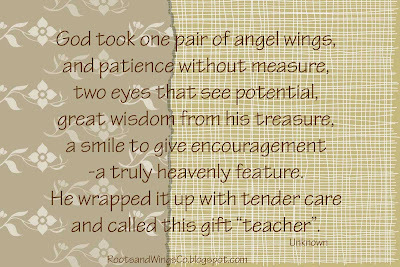 I think every teacher would love a special gift like this. This is fabulous! I am also a mother a child on the spectrum and always include everyone even if they are only with him one hour week. We just did May Day flowers using pots from the dollar section at Target and cheap marigolds. It only cost a little over $2 per teacher. Anyhow, I was wondering about the reusable bag - how did you make it? Thank you so much, I will be a return visitor! She uses two layers of fabric. You can use the stuff that they make diaper covers out of for the inside layer to make it waterproof. (Sorry I don't know what it is called) You can most likely find that at a fabric store. I am using the clear plastic that you get to cover table clothes with but it is very hard to sew (sticks to the foot and the pad). It is what I can get with out driving 45 minutes one way. Anjeannette suggested I use a piece of tape over the plastic where I want to sew. This way it will go through the machine with out sticking. Please post a picture on our flickr group if you make one. I would love to see it. I may make some of these out of Autism Awareness puzzle piece fabric for the ladies in the Autism class. Wow! I love when Moms express their appreciation. I bet your kids' teachers LOVE you! 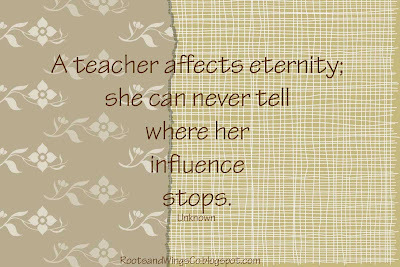 Seriously though, We love all our children's teachers. I still keep in touch with my oldest's pre-school teacher. I haven't seen her in a year and am thinking I need to change that. It has been two years since he was in her class. They are all such great people. I can see being friends with many of them. They deserve our thanks and I go out of my way to think of really nice things for them.